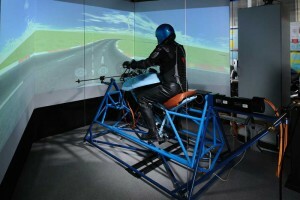 What is the SafeBike riding simulator ? 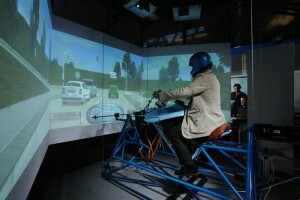 The SafeBike riding simulator is made of a motorcyel mockup, a system of sensors to monitor the rider actions, a real-time multibody software to simulate motorcycle dynamics, five actuators to generate the motion cue (roll, pitch, yaw, lateral motion and handlebar steer), three widescreen for the visual cue and a 5.1 dolby system for the audio cue. Why the SafeBike simulator ? Due to the high number of road accidents thatare recorded in all the streets of Europe, especially in recent years, the problem of road safety is a topic of primary importance. The rider simulator is an important tool to better investigate this kind of problem and find solutions that increase and improve riders safety. Available since 2003, SafeBike is continuolsy under development and represents the state-of-the-art of motorcycle simulators. Despite the great interest on road safety, little has been done to traini those who must drive /ride a vehicle safely and in particular this applies to motorcycles. 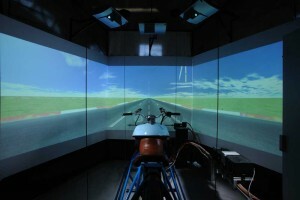 Now, with a motorbike driving simulator it is possible to reproduce the real environment in a confined space, controlled and safe in order to recreate the real sensations in the driver who is immersed in virtual reality. With SafeBike you may simulate a qualify lap or even a race and you may practice on your preferred cicrcuit. As the virtual motorcycle model is very detailed and accurate, it may helop to find the optiimal setting, either you are a professional or you ride for fun. H2IL: Hardware & Human in the Loop. SafeBike emulates many on-boad sensors plus addditional sensors (accelerometers, GPS, etc.). All data are available on the (customizable) CAN bus so you may test your hardware in a safe and controlled environment, without renouncing a human rider. SafeBike has been succesfully emploied in the development of the D-Air race system, which activate an airbag in case of lateral fall. The simulator has been emploied to investigate teh dynanics of bike falls for developing the airbag activation algorithm. 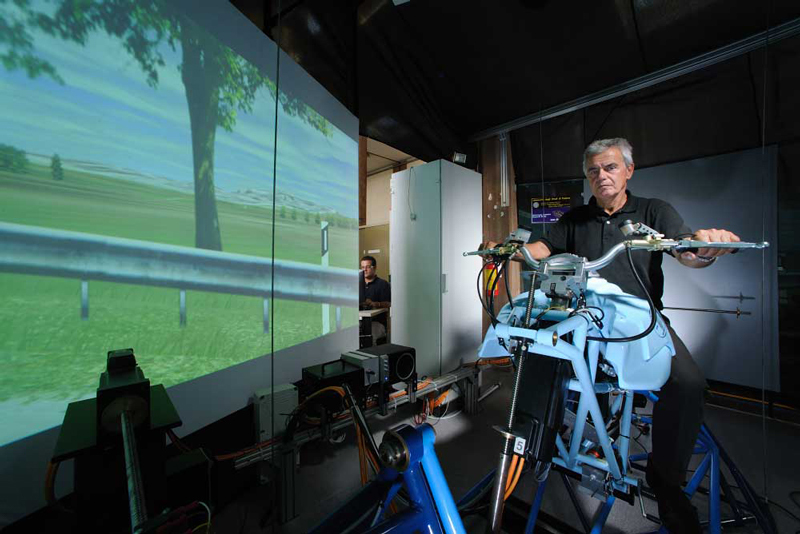 SafeBike has been employed during the SafeRider European Project to develop qand test advanced rider assitante systems such as the Curve Warning, the Frontal Collision Warning and the Intersection Support. 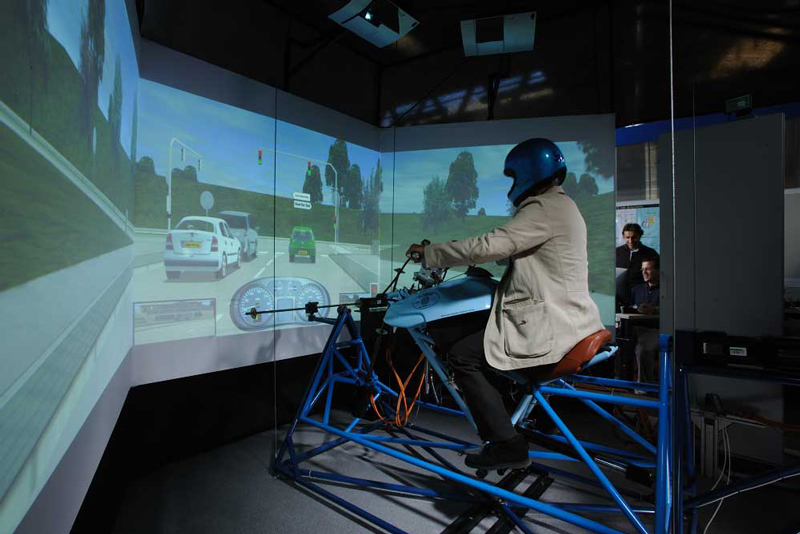 SafeBike has been employed during the 2-BE-SAFE European Project to investigate human rider behavior and to understan to what extent riding simulators may be employed in behavioral studies.